(Nanowerk News) In seeking to develop the next generation of micro-electronic transistors, researchers have long sought to find the next best thing to replace silicon. 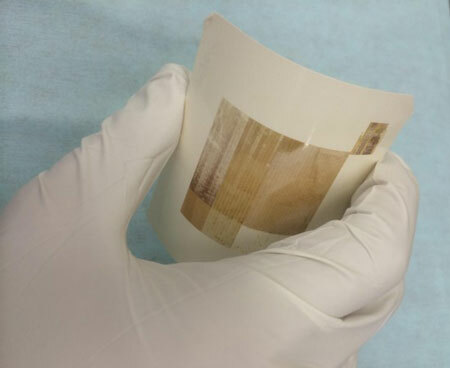 To this end, a wealth of recent research into fully flexible electronic circuitry has focused on various organic and metal-oxide ink materials, which often lack all the favorable electronic properties of silicon but offer superior "printability." Recently, a group of researchers at Delft University of Technology, in the Netherlands, has pioneered a method that allows silicon itself, in the polycrystalline form used in circuitry, to be produced directly on a substrate from liquid silicon ink with a single laser pulse -- potentially ousting its pale usurpers. High-moiblity polysilicon layer was directly formed on paper by coating liquid silicon, which was annealed by pulsed laser-light. The capacity for printing silicon ink onto substrates has existed for some time, but necessitated a 350° C thermal annealing step -- far too hot for many of the flexible surfaces that made production appealing in the first place. The researcher's new method completely bypasses this step, transforming the liquid silicon directly into polysilicon. They discuss their research this week in Applied Physics Letters ("Solution-processed polycrystalline silicon on paper"). "It was very simple," said Ryoichi Ishihara, the professor who led the research team at Delft University of Technology, with collaborators at the Japan Advanced Institute of Science and Technology in Ishikawa, Japan. "We coated liquid polysilane directly on paper by doctor-blading, or skimming it by a blade directly in an oxygen-free environment. Then we annealed the layer with an excimer-laser [a conventional tool used for manufacturing smartphone displays]. And it worked," Ishihara said. The laser blast only lasted a few tens of nanoseconds, leaving the paper completely intact. In testing its conductive performance, Ishihara and his colleagues found that thin-film transistors using the laser-printed layer exhibited mobilities as high as those of conventional poly-silicon conductors. The most immediate application of this printing capacity is in wearable electronics, as it allows for the production of fast, low-power and flexible transistors at a remarkably low cost. Ishihara believes the future of the project, which involves improving the production process of the thin-film transistors to include additional non-silicon layers, will hold a wealth of possible further applications. "The process can be expanded to biomedical sensor and solar-cell areas," Ishihara said, "and will also realize stretchable -- and even edible -- electronics!"